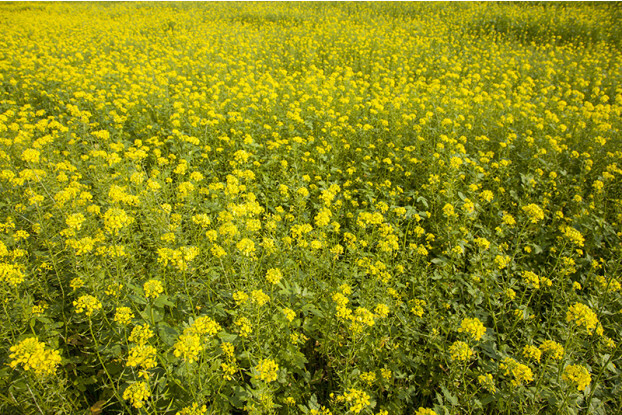 White mustard is most commonly used as a green manure and cover crop. This annual forb germinates and establishes quickly, helping to suppress weeds and reduce soil erosion. When plowed under, white mustard provides beneficial nitrogen and organic matter, helping to improve soil structure and water infiltration. White mustard also acts as a natural soil fumigant when plowed under. Thanks to its unique chemical makeup, this natural fumigant helps reduce soil diseases like potato verticillium, common root rot, and soil nematodes. Especially useful in sugar beet and potato crop rotations.